At this time of post, I'm sure that almost people in this world know what's Facebook. And I believe that every one of us ever once enters Facebook to see its content, to know why it becomes popuplar like that. And about Facebook statistics and features, I don't think I have any new thing to let you know. Within the field of games on Facebook only, Facebook has more than 500 millions monthly active users for top 50 most popular Facebook games only. Yes, I say that over 500 millions; this thing is equivalent to every Facebook account user plays at least a game per month. One more extreme impressive number to any game developer/gaming company. And this is the reason I write this post: Are you feeling bored this afternoon? Do not worry if you have an account in Facebook. Just log in to your account and you will be amazed to know that you are entering a world of fascinating games, maybe they're not best Facebook games but they're addicting games, can really make your afternoon a chilling one. Some Facebook games I'm in playing: FarmVille, Mafia Wars and Happy Aquarium; join me for sharing better experiences if you want. Mainly I like to disscuss the mini games and applications on Facebook. In fact, Facebook has a best web-based platform, the great powerful APIs and full-completed Documentation to help the developers in building the social, personalized Facebook applications quickly and easily; we're having more than 550,000 active Facebook applications - an extreme impressive number to any web/application developer. 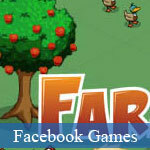 FarmVille is one of Facebook Flash games having landscapes and cute characters. It is extremely innovative and comes with an attractive and fascinating interface. If you want to send birthday cards or any gift to the Facebook friends then this app, Birthday Cards, can help to make a custom designed card. You can organize birthday calendar, get your friend's birthday reminders and create a birthday Zoo! Cafe World is a classic restaurant theme on Facebook developed by Zynga, where the player has to run a restaurant with his close friends. If you like adventure then Treasure Isle is the ideal game for you available on Facebook. In this gameplay you can hunt for treasure by choosing the character in the game. Mafia Wars is a game which is all about Mafia creation. You can play this Facebook game with your friends. Hi all entitled, today I managed to log the in the beginning time in the forum, notwithstanding that his accustomed readers I possess been for some time. thế bạn giải được ko?